In 2015, we were fortunate enough to have held the annual IH Young Learner Conference in Torres Vedras. They were celebrating their 25th Anniversary, and so, in the spirit of the conference theme ‘Looking forward, Looking back’, we took the opportunity to do some celebrating of our own as an ‘IHYL’ family, via a presentation of a short history of teaching and training in the IH YL World. Just how long have people been teaching languages to young learners? It’s hard to say, but a very long time. As far back as ancient Roman times, before formal schooling even, the ruling classes hired Greek servants for their young children who would instruct them to read and write in Greek. Techniques were brutal, consisting of huge amounts of rote learning, but there is evidence of early CLIL type approaches with other subjects being instructed in Greek and of those in search of further learning taking educational trips to Greece for ‘immersion’ language learning. Driven mostly by socio-political factors, young second language learning continued in various parts of the modern world until the 18th century when fear of language interference saw it confined to secondary education where it could “do the least damage”. In the 1950s academics started claiming there was a period when acquisition takes place naturally and effortlessly, so people started to reconsider ‘earlier’ language learning and exploring the idea of exploiting a child’s greater language learning potential. One popular theory of the time was that of the two hemispheres of the Young Learner brain not yet being lateralized, therefore enabling a whole brain approach to learning languages. However, by the 1970s there were two main schools of thought at odds with each other: those for, and those against early language learning. Although large scale research done at the time didn’t support the view that early language learning was harmful, it also didn’t show evidence of it being beneficial either, leaving policy makers hesitant to invest in the idea. In the late 1980s, new research highlighted the many additional advantages of an early start to language learning, e.g. the knock on effects to general intellectual development, greater awareness of their own language and cultural enrichment, etc. With the introduction of the European Union came a new era of language learning in Europe with policy makers in the 80s and 90s not only recommending early starting ages, but also age-specific methodology. You no doubt already know that IH was founded by John and Brita Haycraft in 1953. They both believed deeply in quality language teaching stemming from quality training and that were pioneers in the field. The IH Certificate, launched in 1962, was ground-breaking at the time. It grew to be known as the ‘RSA’, then the ‘CTEFLA’, when Cambridge took over its administration and, as you know, in 1996 it was updated and renamed CELTA. So much for IH and adults language teaching, but how much do you know about IHWO and YL? During the growth in teaching YL throughout the 80s and 90s, which was driven by both demand and policy, schools around the IH network began not only teaching YL but also becoming interested in the specific needs of students, parents and teachers alike. One such person who recognised this was Annabelle O’Toole, who coordinated and ran the ITTI YL course in Portugal as early as 1983, with Xana de Nagy joining her from 1988. It was an exciting time of growth with all sorts of wonderful things happening, e.g. 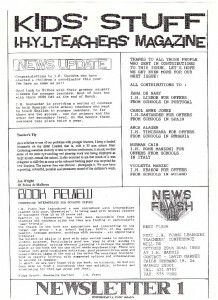 IH Buenos Aires were producing a teen magazine, and in November 1992, following a great idea from Susie Parker, IH Lisbon, with the help of IH Rome, hosted the first ever IH YL Conference. Gay Adamson opened the conference by making reference to the changes in EU policy and highlighted the need for schools to work together. And work together they did. Delegates from 22 schools talked about trends, ideas and issues in teaching YL, and their discussions over those 2 days were the catalyst that helped shape the organisation we are today. Some of the many ideas discussed at this first conference included putting together an IH YL Newsletter, creating a directory of schools, YL targeted marketing (chaired by Monica Green) and creating a YL Teacher Training Course based on the YL TT already happening at schools around the network. Norman Cain of IH Rome volunteered to coordinate the very first IH YL Magazine. He produced and distributed the first issue in early 1993 with articles collected from regional coordinators in Lisbon, Santander, Romania and Poland. Given it was 1993, i.e. pre-internet and pre-IHWO as we know it today, this must have been quite a feat and something for the organisers to be really proud of. It also shows that from early on, IH affiliates have worked together to support each other and strive for greater things. It’s not just organisational achievements we can be proud of. Throughout the network there is, and always has been, a vast wealth of incredibly talented and knowledgeable individuals contributing to TEYL as a whole. For example, also in 1993, Jan Wright of IH Palma (de Mallorca) wrote the teachers books for both Buzz 1 and Buzz 2. YL Conferences continued to be a great success and went from strength to strength each year. As mentioned above, IH has a long and successful history in teacher training. And the same is true with YLs. In 1996, Xana and Paula de Nagy piloted and ran the first Cambridge CELTYL and YL extension at IH Lisbon, for example. In 2000, shaped by courses running both at IH Lisbon and around the IH Network, the IH YL course (first mentioned in 1993) began to take shape. That same year, Michael Carrier created a teacher training steering group to discuss TT issues around the network. The first course to emerge out of this was the IHCYL. Paula de Nagy and Antonia Clare (who were the only YL people on the committee) put together an overview and delegates at the 2000 YL Conference gave feedback on the proposed ideas. The resulting first sessions were written by YL specialists from around the network. Many people were involved in putting together the early version of the IH CYL. But there was one rather modest person who was instrumental in making it all happen. The person who co-wrote the overview, coordinated session writing, wrote sessions and the first handbook herself: Paula de Nagy (IH Lisbon, pictured). Up until this point, things were coordinated via the schools themselves and the affiliate network department which was then part of IH London, but then in 2003 IHWO became a separate company. For many people, the 2003 YL Conference in Campobasso signified a turning point in YL conferences, largely due to the inclusion of sponsored speakers. YL training videos were created, such as those filmed at IH Huelva, and resources were collected and collated to be shared across the network. During the YL Conference in Milan in 2005, Jenny McKane (pictured) presented a session that was so well received she was invited to write a YL Coordinators’ handbook for IHWO. She did such an amazing job that, over the years, only a few tweaks have been made and the almost original version she wrote back then is still valued and used today by DOSes around the network. Also during this period, all sorts of resources were created for the IHWO website and the IH CYL was updated with 2 new sessions. In 2009, Shaun Wilden took the IH CYL to the greater world, putting it online as a blended learning version of the course. New, new and swine flu! In 2009, for the first time since it began, the annual YL conference could not take place (due to the swine flu epidemic). Until this point the Conference was always held in November but, as everyone was anxious to get to Kiev as soon as possible, the conference was postponed to early 2010 (with every conference since taking place in the spring). Meanwhile Jane Harding de Rosa had taken over as the YL Coordinator for IHWO and set about coordinating a complete overhaul of the IH CYL. At the YL Conference in Kiev, Coordinators from around the world were invited to participate and contribute. 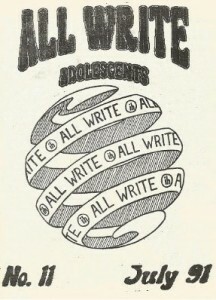 The course became the IH CYLT (the T being for teenagers). New paperwork was introduced for assessment and every session was updated or rewritten by Jane and a team of writers. The ‘new’ course was presented at the YL Conference in Mataro in 2011. In 2011, Kylie Malinowska, that’s me, took over from Jane in the newly named role of ‘YL Advisor’ for IHWO. Times were changing rapidly with IHWO now offering Live Online Workshops (LOWs). In 2011 the first ‘YL’ LOW was given by yours truly and others were encouraged to present YL workshops both for LOWs and the IH Teachers’ Online Conference, which they did. Website resources were updated, IH YL Facebook pages and accounts were created and the YL Google group, originally created by Jane Harding de Rosa, was reignited. At the YL Conference in 2012, hosted by IH Prague, IH CYLT tutors and some of the IHWO team met to discuss and get feedback on the new IH CYLT ready for its grand release. 2012 was a busy year for YL Training. In line with the creation of the IHWO Assessment Unit, the IH CYLT tutors’ standardisation process was also created and implemented. A huge undertaking, managed by a team from around the IH network. And… the new new IH CYLT was officially released. Throughout the 2000s, our students had been getting younger and younger, and despite the fact the New IH CYLT was intended to cater for this, schools were calling out for help to train up their staff to teach VYL. So, in 2013, a team of VYL specialists from around the network wrote a new YL Training course. The IH VYL. In the second half of the year, IH Prague, Milan, Almaty, and Cordoba piloted the course with great success. At the 2014 DOS Conference in London, we announced that Cambridge English Language Assessment would now moderate the IH CYLT and that their logo would appear on the end of course certificate. This acknowledgement by an external body of the value and quality of the IHCYLT course is a testament to the collective knowledge and expertise that have gone into developing it over the years. At the 2014 YL Conference in Bristol, delegates had their awareness of Child Welfare Policies raised and the release of the 4 week online BESD (Behavioural Social and Emotional Disorders) course ‘Taming the Wolf’, created by Emily Lee, was announced. And, at the end of 2014, the IH VYL was officially released and an online version of the course created and piloted. 2015 continued to be busy and bright with Beccy Wigglesworth putting together comprehensive guidance and training support to schools around the area of safeguarding children and vetting staff. Bringing information to the world! In 2016, the number of course participants around the world doing YL training with IH exploded! The monthly YL Digest was introduced and Shaun Wilden headed an exciting new project to create self-access training modules specifically for those teaching teens. In March, we all excitedly went to Malta for the YL conference and saw what it’s like to have summer school in ‘Paradise’. And Alison Sturrock was again working on an exciting summer social media project for teens and the postcard project headed by Glenn Standish from IH Torun continues to thrive. It would be impossible for me to include everything and everyone. From the numerous IH staff who’ve written coursebooks, to the YL Departments that have grown from 8 students to 200, to schools fitting out every classroom with smartboards, kids’ clubs, summer camps, book clubs, and centre-created teacher training courses, the IHWO network really has been and still is bursting with exciting YL projects. There is even an IH TV! Not IH TV as in Torres Vedras, but IH TV! IH Kharkiv have their own TV show on a local TV network. We have so much going on in so many schools that as an organisation, we really do have a lot to be proud of. And to celebrate! Over the past five years I feel very privileged to have met so many wonderful individuals and visited and been in contact with so many great schools doing great things. A VERY big thank you so much to all of the people who volunteered the above information and photos, and of course to all of the people from the past, present (and future) who not only make the organisation great, but more importantly represent high quality YL teaching and training. I look forward to seeing what the future holds, both with IH and YL teaching and training.